Yes, you heard that right, brand popularity and the overall reputation of the brand are the new building blocks for SEO. These terms although, are not new, but in the context of SEO, these are still in the stages of infancy. Most of the webmasters are still figuring around loopholes to get on the first page of Google without realizing the fact that Google has slowly laid the focus of their main ranking algorithm on brands. Not getting? Then please check Google SERP and you will find that most of the results that come on the first page for competitive keywords have popular brands listed in them. There are maximum chances that these brands are those which we have heard of in the past or until recently. The increased focus on branding was due to the fact that “Brand Optimization” is the most difficult thing to do and spammy tactics simply don’t work here. This article will explore the opportunities available for the site owners in order to transform their websites from mere collection of webpages to a legitimate brand. Branding involves all the strategies, efforts, advertisement campaigns, innovativeness that helps people recognize a brand. In older days, symbols were engraved on the back of the sheep in order to make them distinctive. These symbols slowly and gradually developed to what we call today as “branding”. Now, branding involves all the strategies involved in making the symbol recognizable. Ask a simple question to yourself “Is your brand recognizable on the web?” If Yes, Google will see it and provide importance to your website which in turn will help it to get high rankings. Else, if the answer is No, then Google will have less trust on the site and you will have difficulty in getting it ranked. Why Branding Matters in SEO? Branding helps to establish a relationship between your business and your customers. A positive relationship makes your brand stand apart from your competitors. At the end of the day, every business wants higher return on investment and the only step is to please your customers. Having a proper branding strategy in place helps to make this bond between you and your customers become stronger. Google puts a greater focus on brand that are having a positive relationship with the consumers or in other words, brands that are trusted and valued more by their customers. It is more of a common sense for Google to display those brands in the search results that serves the demands of the users in the best possible way. Google knows XYZ brand has been doing that in the past and hence it ranks it higher on the search results. Google always wants to present the best results to its users. For example, if someone enters the query “shop online” then Amazon and Overstock are ranked higher. The reason being, Google trusts these brands more and they enjoy a higher trust and reputational scores than their competitors. How to Increase Brand Value? Identify your target market and take time to understand your audience. Conduct proper market surveys and make a list of what the audience desires. Plan your internet marketing strategy accordingly after implementing the suggested changes on the products and services you sell or are planning to sell in the future. Identify modes of connection with your consumers. 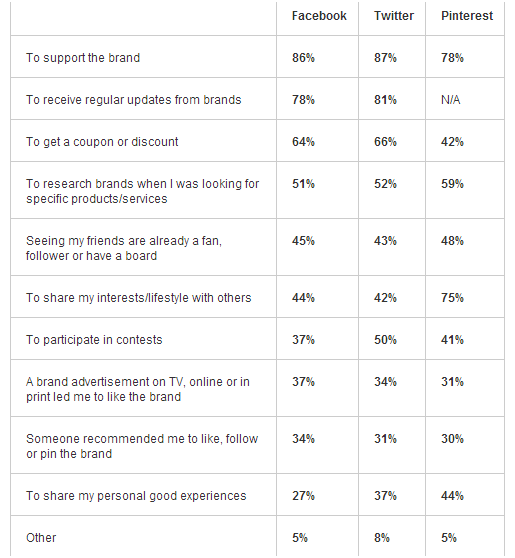 Social media has come out as the strongest platform in connecting with consumers. Platforms such as Facebook, Twitter, LinkedIn, Pinterest etc can largely help your overall marketing efforts. A studyconducted by the Center for Marketing Research, University of Massachusetts Dartmouth suggests the top reasons why people interact with the brands on the leading social media sites. The chart given below displays the main reasons for interaction. This is a great hint as to where you should focus your social media marketing strategies. Let your brand become the “talk of the town”. Implement strategies like SEO, PPC, SMO, Email marketing, offline promotion etc so that people start recognizing your brand. One of the best examples I can give is of Coca Cola. The marketing team of Coca Cola has done some of the greatest innovations in terms of both online and offline marketing. One of the best ways to make your brand come out positive in the eyes of your consumers is to deliver more than you promise. If people start liking your brand at a personal level, Google will be forced to take notice of your brand. One of the most important aspects of successful marketing strategy is proper analysis of your competitors. Make use of tools like Ahrefs, Socialmention, Semrush, Opensiteexplorer etc in order to identify where the brands are getting the maximum attention. Remember the core of the ranking algorithm still remains the same and that is the backlinks. Make sure your site is getting the bulk share of authority backlinks. Of course, branding will help you get those. Instead of keeping with the old products and services, do something new. Always have something to remain in the NEWS. Tie up with news distribution channels and ask them to cover your brand at least once on a monthly basis. This will help to keep the brand in the news and make Google realize the importance of your business. Once you start experiencing the positive outcomes of your brand, do not sit back and relax. It’s time for you to start working harder. Top brands always remain on the top because they are consistent. Try to remain consistent in whatever you do, whether its innovation or marketing. The overall reputation of the brand is extremely vital for the overall success of the marketing campaign. Online reputation management is one effective technique in keeping the reputation to an optimum level. People like to scrutinize the brand before tying their products and services and if we lack or leave loopholes there then the main purpose of the branding will get destroyed. Making the brand popular in real terms will only be successful if the reputation of the brand comes out clean in the eyes of the consumer. Branding- Take every effort to understand, strategize and guide the way the marketing department plan out their strategy. Input from SEO/Inbound marketer can immensely help to guide the marketing strategy to a level that it indirectly starts to position the brand’s website strongly in search engines. Also, don’t forget to present the brand as reputable in the eyes of Google. Social Media- We just cannot leave out social media and expect a miracle to happen. Social media should be used to increase the brand value and build citations for the brand. Backlinks- The main algorithm of Google still values backlinks and every SEO strategy should be planned after carefully analyzing the competitors and identifying each and every resource that can help the brand to earn backlinks. Authorship- Same as with branding, authorship will help Google to correctly recognize the person behind the site and rate it high based on the agent rank of the author. Hence, branding without authorship will not yield as good results as compared to branding with authorship. Think of a scenario when highly reputed authors cover your brand on a daily basis. Google will start taking this account and rank your site higher up. But, remember every author is ranked on the basis of the industry he covers so don’t fall in the trap of one author works for every industry. As explained in the above article, every strategy of SEO should revolve around brand. If your strategy is ignoring the brand then you are heading for the wrong way. Include your brand in every strategy you plan either online or offline and keep backlinks and author rank in top priority. You will soon enjoy happy branding and happy rankings.